A part of the nursery is taken by our extensive Maple collection, consisting of almost all hardy species and a wide range of cultivars. We call this collection our 'Aceretum'; it is very interesting during May and June, when the young leaves develop and in the autumn when the flaming colours make a wonderful display. We have expanded this collection into a new part of our nursery along with our collections of the genera Buxus, Pieris and Lonicera. The collection is larger and more interesting than ever before with well over 1000 different maples. We think that a visit to our nursery is worthwhile. (no boots necessary). 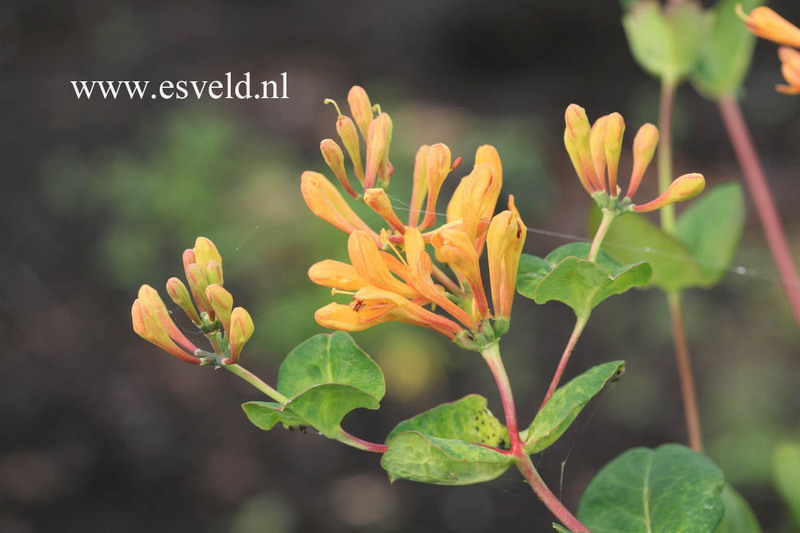 On our nursery several of the Dutch Plant Collections can be visited. 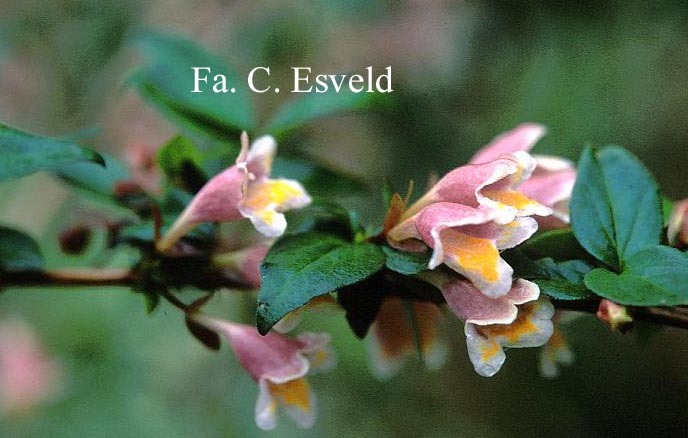 These Dutch Plant Collections are an initiative of the Royal Boskoop Horticultural Society (for more information see the website of the NPC. 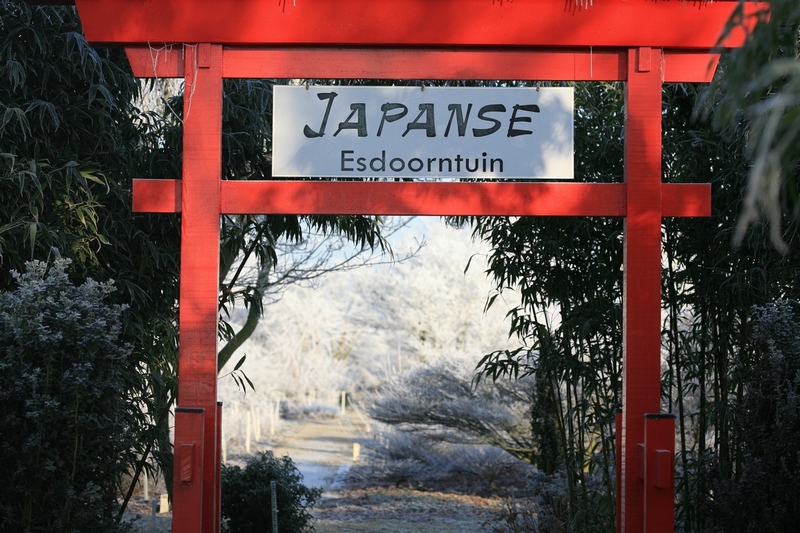 The Dutch Plant Collections on our nursery are: Acer ( the Aceretum, described above), Hydrangea, Buxus, Camellia, climbing Lonicera, Pieris, Enkianthus, Ilex, Abelia, Sarcococca, Osmanthus and Japanese Azalea. The collections are open to visitors free of charge during business-hours. A complete inventory of the collection is available and also updated when necessary on the Internet, it can be found at this page. 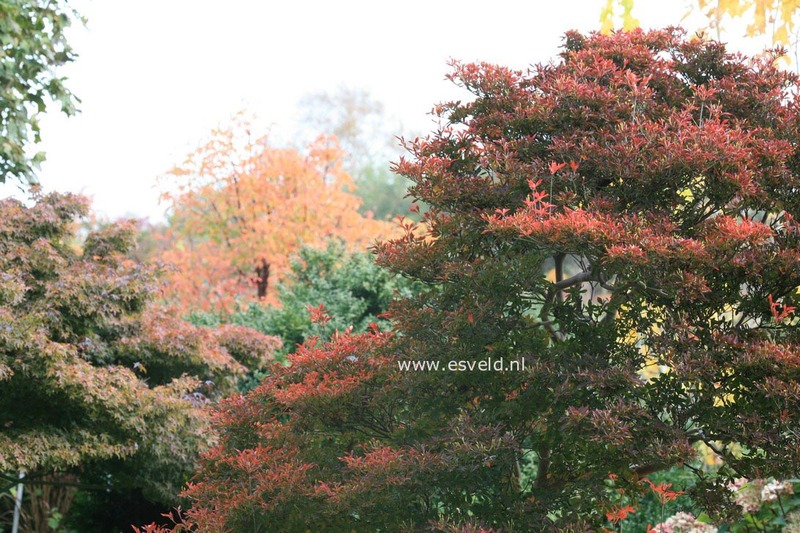 The Dutch Plant Collection of Acer is very large and has well over 1000 different species and cultivars. Very likely this is the largest collection of maples in the world at one location. 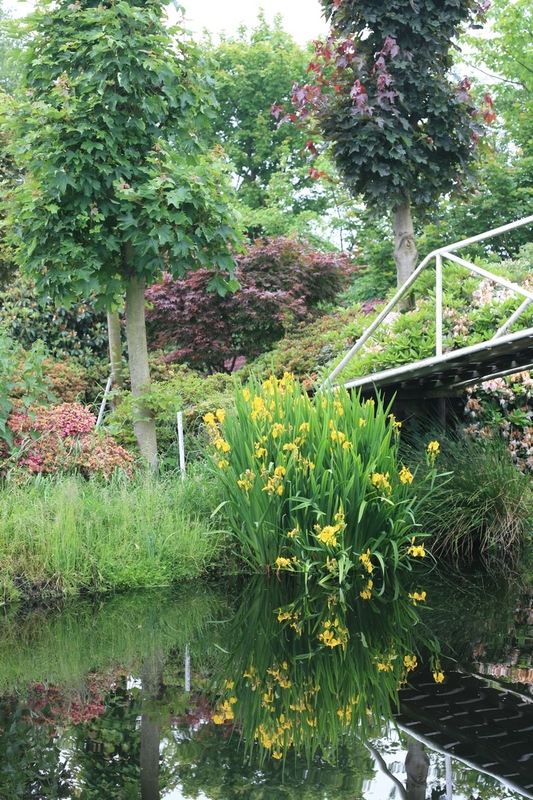 The collection started in the 1960's and about 1970 the name Aceretum was invented. De starting point for the collection was the extremely large specimen of Acer shirasawanum 'Aureum', then still known as Acer japonicum 'Aureum'. This colossal plant is still the centerpiece of the collection and is now about 140 to 150 years old. This plant really shows its age by not growing anymore. Nobody knows how old this plant can get. The first plants of the collection were planted out in 1970 and already a few years later there were over 100 different planted. The interest in the species also grew and over the years many more were added to the collection. The Aceretum was planted as an arboretum and many paths were laid out. It now takes about 1 hectare. Now, 30 years after the start, many plants came to full maturity and the Aceretum now really breaths an oriental athmosphere. 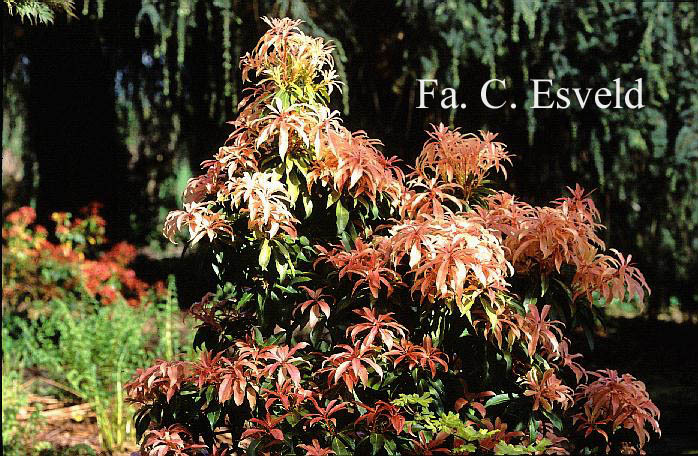 Some of the more notable specimens include Acer griseum, Acer buergerianum 'Mistuba kaede', Acer distylum, Acer pectinatum forrestii and many cultivars of Acer palmatum. Also many sometimes extremely rare species are present, such as Acer pentapomicum, Acer caesium, Acer pentaphyllum and Acer sterculiaceum ssp. thomsonii. In the course of the years many societies and other organisations visited the Aceretum. The high point in this was the visit by the International Dendrologicy Society in 1995 on the occasion of the Acer Symposium held that year in Wageningen and Boskoop. Many well-known dendrologists of the world were present at that occasion. The Aceretum is divided into two parts, the 'Old' Aceretum is the original part. The 'New' Aceretum was started in 1990 because the old part was totally full. 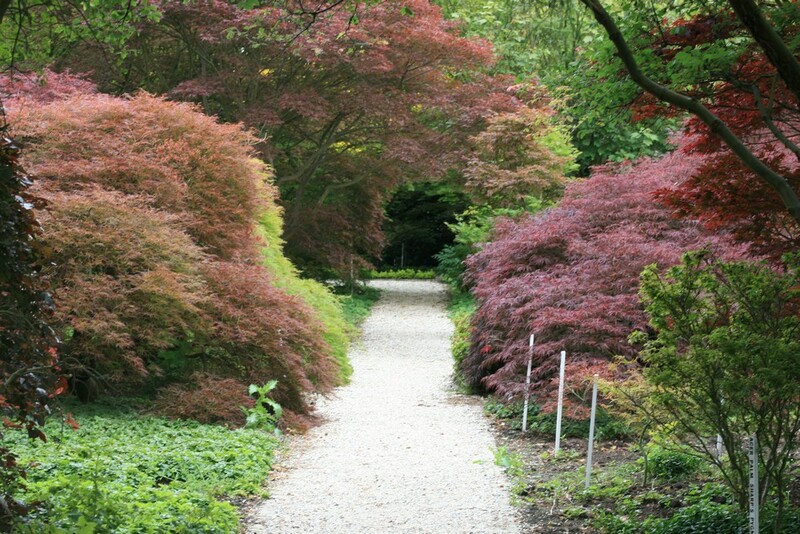 In the new part also the collection Japanese Azalea was planted, a winning combination as it turned out. Also a long border with mostly German Rhododendron cultivars is planted here. This new part has been completely renovated in the winter 2004-2005. The entire list is here. This collection started in the early 80's out of curiosity to the remnants of a flourishing Buxus culture earlier in the 20th Century. Many of the then cultivated cultivars of Buxus sempervirens were in danger of disappearing, many of the different cultivars were only still present in old gardens and estates. 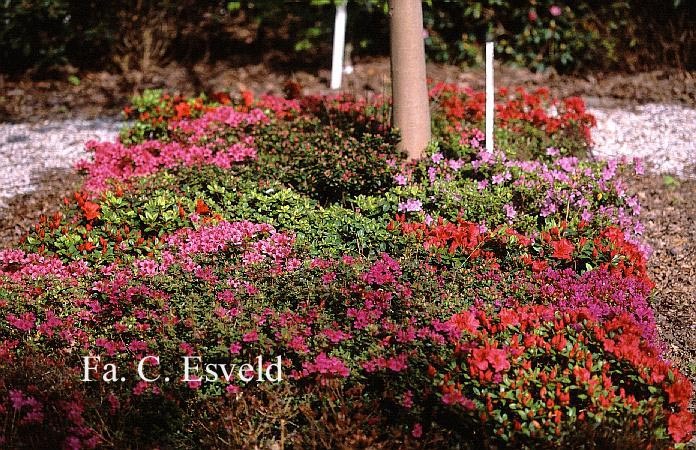 Later, in the middle of the 80's, the interest in Buxus widened to the other species in this interesting genus. Especially the nomenclature proved to be a challenge. The collection that grew out of this interest and desire to collect them all resulted in 125 different named species and cultivars of hardy Buxus. The plants in our collection are never cut back and thus show their natural habit. 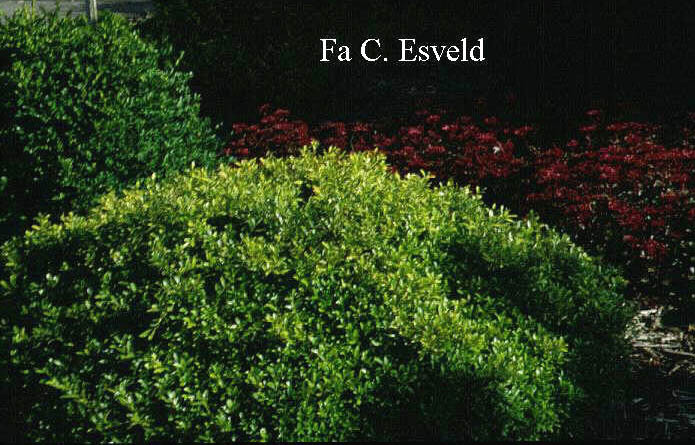 The collection is now a nearly complete overview of all forms of Buxus available in Europe. The entire list of the collection is available here. The mere existence of the collection has been the reason of several publications about Buxus in the last few years. The collection is located at the beginning of the Aceretum, all plants are clearly labeled and can easily be used as a base reference. Camellia sasanqua was the starting point for the NPC Camellia in our nursery. It started with an accidental encounter with these Japanese autumn flowering Camellias in an English garden. Our collection grew quickly. Not only the true Camellia sasanquas found their way into the collection, but also the socalled Ackermann hybrids from the United States made their appearance, inspired by the development work done by Jan Kortmann. Quickly the interest went also to the other hardy species and cultivars.Camellia japonica, de best known of all Camellias as a garden plant is also represented with a good number of different cultivars in the collection. We do not however strive to make a complete collection of these: there are literally thousands of different named cultivars, simply too many to collect them all. We treid to make a good representative selection here of proven cultivars and newly named ones.Because the flowering period of Camellia sasanqua and her hybrids is so different from the springflowering Camellia japonica the collection is interesting for a visit a very long time in the year. Already from late September the first sasanquas come into flower and the last japonicas make it just into may. Now fill in the summer months... To be honest: that is coming! Hydrangea macrophylla is the best known group in Hydrangea and in this group there are many hundreds of cultivars introduced in Europe, Japan and America. 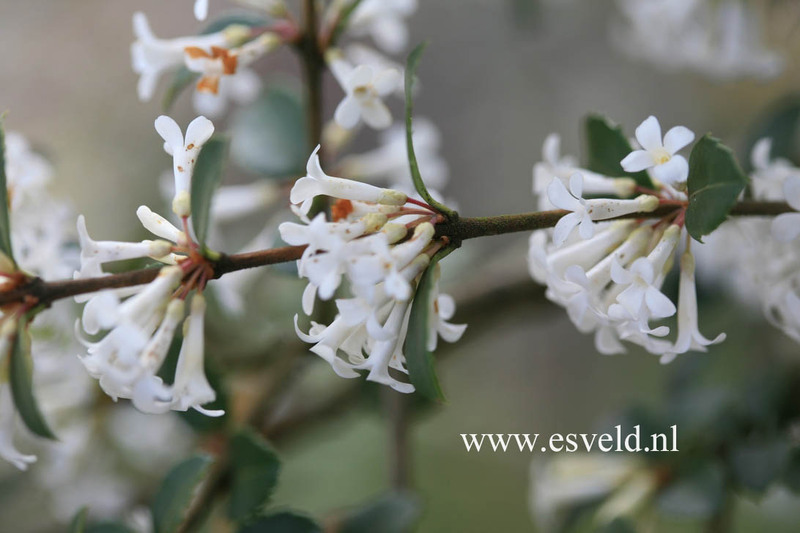 Many of these are planted in the Aceretum as borders in various parts of this garden, where also the collection of climbing Lonicera is located. But not only in the Aceretum, there are several places in the nursery where groups of these are planted together, from evergreen climbing varieties in the hollies to a large group of Hydrangea paniculata and close relatives. We are proud of the extensive collection of the Japanese mountain-varieties of which the tea-variety is the best known. About half of the about 400 different Hydrangeas are in the Hydrangea macrophylla group, the other half belong to the many other groups in Hydrangea including a great number of less-known species and cultivars. A complete inventory is found at hier. The new Sarcococca collection is a 'relative' of the Buxus-collection that we already have for many years. The genus is closely related, both are part of the Buxaceae. It is a genus of which the nomenclature and classification always have been unclear. Partly thanks to our employee Arjan Laros who made a study of the genus, resulting in a scientific paper in Dendroflora, more clarity has emerged. 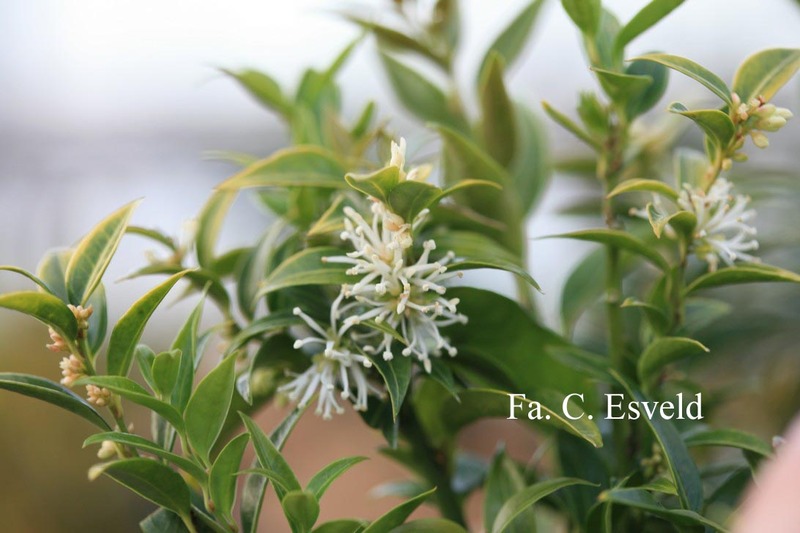 In the past 20 years we have now collected most species and cultivars of Sarcococca and now they have been successfully identified and named. The collection comprises of over 10 species and cultivars and that makes it virtually complete. Interesting to see was that also the larger Asian species as Sarcococca orientalis and wallichii proved to do rather well in our climate. Especially the orientalis which has, like all other species, richly scented flowers appears to be an asset to the assortment of available species. Nice evergreen and well-scented small plants can be put to very good use in the garden! Inventory list hier. We think that a visit to our nursery is worthwhile. (no boots necessary). All collections are open to visitors free of charge during business-hours. The entire list of the collection can be found here.